Take the kids to the best playgrounds in London - they're fun, they're outdoors and they're free. Set sail at the pirate playground and find out the best outside play spaces in the city. Set sail on a pirate ship, unlock the treasure chest and make music with your feet. This truly magical place is a kiddie's wonderland and the ideal jaunt for family fun. The focal point of the commemorative Diana, Princess of Wales Memorial Playground in Kensington Gardens - also known as the pirate playground - is an intricately detailed pirate ship, moored aground in a sea of, immaculately kept fine, white sand. 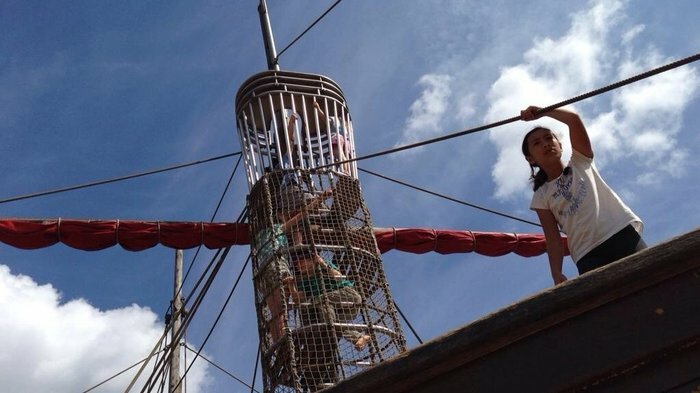 Children up to the age of twelve can clamber up the rigging all the way to the crow's nest, turn the giant wheel, explore the cabins and tug on a myriad of pulleys and ropes. It really is fantastic. Beyond the land of pirates lies the tepee camp, a tree house encampment with walkways slung between trees and ladders, and musical instruments. NOTE: unaccompanied adults aren't allowed in - children are at the helm in this little part of our capital, designed solely for them. Avondale Park in Notting Hill includes an extensive playground, changing facilities, public toilets and food kiosk housed in conical wooden houses reflecting the kiln and potteries which used to be in the area. Created in 1892, Avondale Park was named after the then recently deceased Duke of Clarence and Avondale. Today the Notting Hill park includes an extensive playground, changing facilities, public toilets and food kiosk housed in conical wooden houses reflecting the historic kiln and potteries which used to be in the Avondale Park area. The park is also equipped with a Multi-Use-Games-Area (MUGA) with areas set aside for football, netball and tennis. The Kensington Memorial Park is a great place to take the kids, not least because it has an excellent water play area, a great playground and a One O'Clock Club - all of which is free. The Kensington Memorial Park is a great place to take the kids, not least because it has an excellent water play area, a great playground and a One O'Clock Club - all of which is free. Refurbished as part of the 2006 to 2015 ten year strategy, it is wheelchair accessible and the playground has two play areas - one for toddler with a sand pit, and a larger play area for older children centred on a space rocket climbing frame. But the water play area is the part that really makes it stand out - especially on hot summer days. There's a small kiosk next to it which is open during the summer months selling hot and cold snacks with picnic tables outside. The park also includes tennis courts, football, and cricket. Kensington Memorial Park occupies land bought in 1923 with funds provided by the Kensington War Memorial Committee who wanted to create a suitable tribute to those who had given their lives in the First World War. Small, pretty park in West London with two playgrounds and an ecology centre. West London has the pick of the parks with Holland Park, Kensington Gardens and Hyde Park all in quick succession - you can walk all three if you have older children. For kids, Holland Park has an open expanse for games and general frolicking, and playgrounds divided into two spaces: one with a zip wire and climbing rocket ship as well as an ecology centre for older children; and second sand pit area complete with swings, climbing frame and slide for younger children, under 5. A cafe and peacocks roaming around complete the picture and in summer there's usually a family-friendly open-air opera as park of Opera Holland Park, performed at the park's temporary theatre. Expanse of green space in the heart of London's artistic hub on the South Bank. The concrete promenade along the South Bank greatly benefits from this large patch of green grass for striders, strollers and sightseers to relax on. Not only does Jubilee Gardens have a host of top-notch attractions on its very own riverside doorstep - the London Eye, Aquarium, London Dungeon and Southbank Centre to name but a few - but it also provides a wonderful playground for children under 11 with large timbers and rope nets provding a natural climbing frame. It's also a picturesque meeting place across the Thames from Big Ben and the Houses of Parliament, a good jumping off point to explore the South Bank. Occasionally there's a carousel and a small fun fair at the foot of the London Eye to add to the fun for little ones. Rock pools, sand pits, tall treehouses, and rope bridges within the Queen Elizabeth Olympic Park. Trees form climbing scrambles and tall nest-like dens are connected by wobbling net walkways at the Tumbling Bay Playground within the Queen Elizabeth Olympic Park - a vast space, the same size as Hyde Park and Kensington Gardens combined. Rock pools, sand pits, tall treehouses, and rope bridges give children the chance to play in a natural environment that encourages them to experiment. Built on the natural landscape of the Olympic Park, this inspiring playground has slides, swings and plenty of space to run about. The Tumbling Bay sits alongside the Timber Lodge community centre and cafe, where parents and kids can relax and refuel. Designed by play space experts Land Use Consultants and Erect Architecture, the playground includes the Cross and Cave, a sculpture by Heather and Ivan Morison. Tucked away in the city centre it covers five acres and contains a park, playground and small menagerie. Battersea Park has a zoo, lake and two playgrounds within its 200-acre green space. Situated on the south side of the Thames, Battersea Park caters for children of every age within its 200-acre space. Firstly, there's lots of water - a lake for boating, ponds for admiring the wildlife, and the Thames along one side. Children get a great deal with an adventure playground for 5 to 16 year olds which includes rope swings, chain ladders, tube slides and zip wires, located next to a toddlers' playground for under 5s. You can also visit the Battersea Park Zoo, at extra cost, and meet the monkeys or take a stroll to the majestic Peace Pagoda. Wildlife thrives here with birds, animals and plants happily cohabiting within the grounds. For kids who like culture, there's the Pump House Gallery which has regular exhibitions and there are many sculptures dotted around the park itself. Next comes sport with the Millennium Arena, all-weather pitches, tennis courts and a place to hire bicycles there's no excuse to be lazy. Large green spaces for sports and an adventure playground on Saturdays. Peckham Rye combines the Park and Common providing a large green space for sports, sun bathing, families and ducks. Notable attractions for families and children include the popular skateboard area, two playgrounds and the Cafe on the Rye next to the One O'Clock Club. For older children aged between 8 and 15 years and with its own 'youth club', the Adventure Playground on the corner of Peckham Rye and Homestall Road is open on Saturdays between 11am and 5pm. The park is full of places to explore: there's a duck pond and outdoor gym, the formal Sexby Gardens which are full of fragrant rose pergolas, the Japanese Garden with its flowing streams, bridges and a woodland area, and the dog free arboretum area where wooden tables make it the obvious place to meet for a picnic. North London park with playground, paddling pool and butterfly dome from May to September. A pretty, local park, Clissold is more than worth a visit if you're in the north London area. Free from the crowds that often seep into more central parks, this dainty, 54-acre space offers many excellent park amenities without the accompanying hoards. Eight tennis courts, an animal enclosure, a children's playground, paddling pool, rambling fields, ponds and pond-dipping platform, rose gardens, an organic nature garden, aviary and butterfly tunnel are among the delights. A stunning café - once the local mansion house - is an excellent place for an alfresco drink. Clissold is not as finely manicured as many of London's parks but it has a lovely community feel to it that makes up for the lack of finesse. Besides this is a working park and all the better for it.